Whilst the government’s Brexit talks, both with Europe and internally, continued to yield no firm conclusions in February, Sterling investors inferred that the chances of the UK leaving the EU without a deal were diminishing, and the Pound continued to gain ground against the Dollar, reaching $1.33: its highest level since last July. Chinese equities took heart from the increasing perception that the country is close to agreeing a trade deal with the US and ending the trade dispute that has been in progress since July last year. The dispute with Washington, together with a slowing economy and deleveraging, saw China post the largest loss of any major market in 2018. Shares rose for the second consecutive month, on optimism that 2019 will prove more positive. The Dollar managed to gain ground against most major currencies other than Sterling, as investors seeking a safe yield continued to buy short-dated Treasury bonds. The US Treasury yield curve remained flat as far as five years out, reflecting the increasingly popular view that the Fed may choose not to raise rates this year. Whilst the German consumer seems to have safe employment and rising real wages, export numbers, factory orders and industrial production have all been poor and Germans are beginning to increase their savings, rather than spend, reflecting growing nervousness. Less German spending means fewer imports of goods from the rest of the EU. Industrial orders and sales were also sharply down in Italy, and French annualised GDP growth was confirmed at just 0.9%. 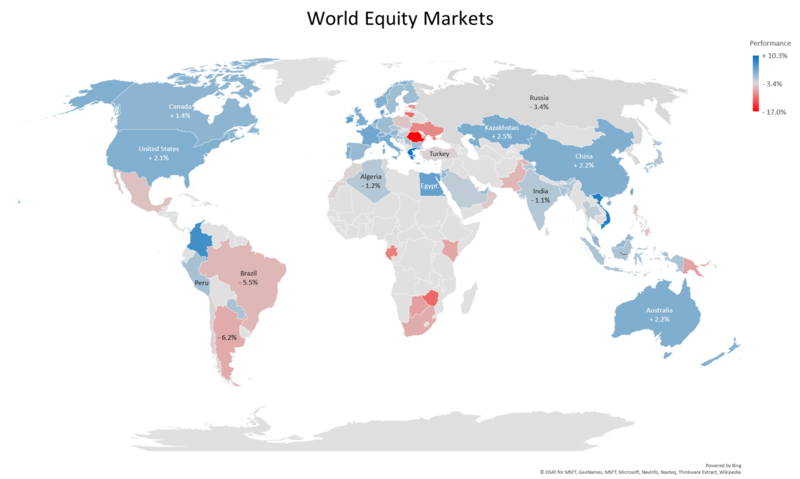 Global equities saw a continuation of their January rally during the month, as investors took a more ‘risk-on’ view of Brexit and the Sino-US trade dispute. A stronger Pound served to reduce the return from overseas markets for the UK investor. Positive returns came from most regions, with China particularly continuing to recover from its painful 2018 sell-off. Chinese growth data was the weakest since the early 1990s, but still over 6%. 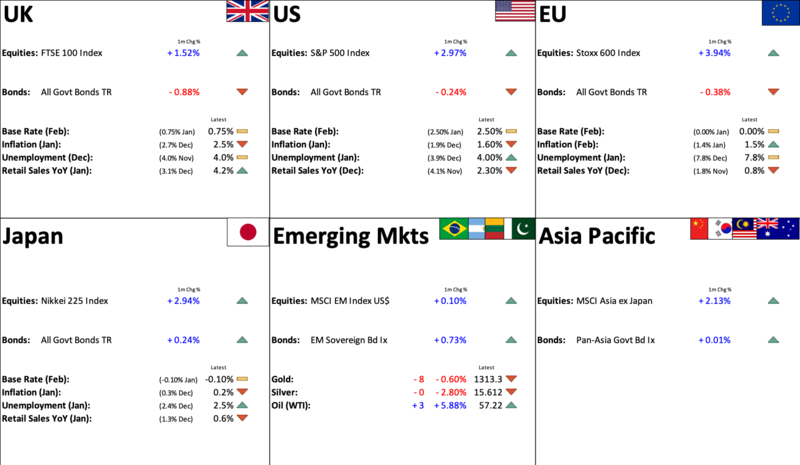 Around the rest of Asia, Japan and the emerging markets were positive in local currency terms, with South America being the most noticeable detractor from an otherwise buoyant emerging markets performance. 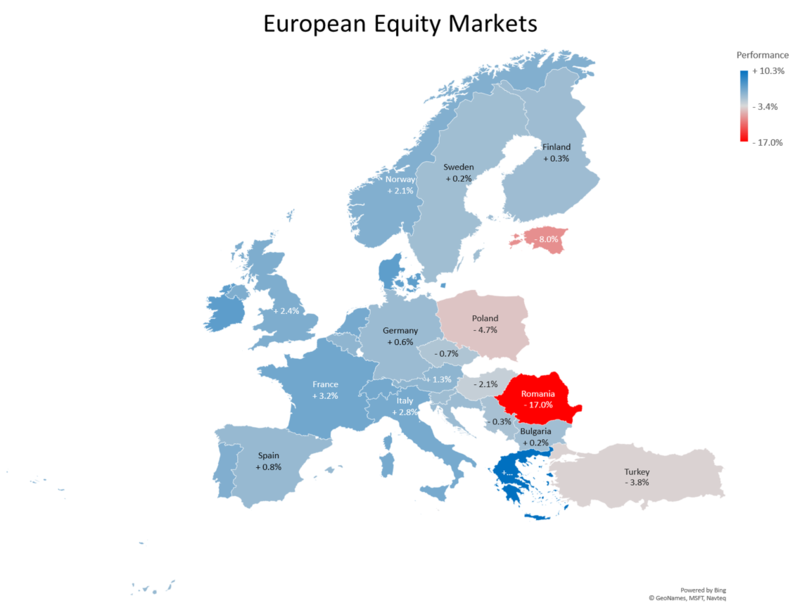 Equities across Europe were broadly positive in February, with the main losers coming from the emerging markets to the East, the worst being Romania. France produced the best return from the major markets, rising by 3.2%, whilst Greek equities gained 10.3%. German equities managed a +0.6% return, as, despite weakening export data, the German consumer still seems to have plenty of fire power as employment and real wages growth remain strong. In the UK, equities continued to attract interest as the new year, and the impending Brexit deadline focused attention on many investors’ underweight positions. Sterling continued the steady appreciation against the Dollar that was seen in January, as investors inferred a diminishing risk of a no-deal Brexit, although the outcome of the present turmoil seems far from predictable at this stage. The Euro saw further weakness as economic data from France and Germany deteriorated, and EU firms became more vocal about the negative effects of Brexit on their businesses. A fall-off in Japanese inflation saw the Yen hit a ten-week low against the Dollar, as investors seeking yield continued to support the US currency. 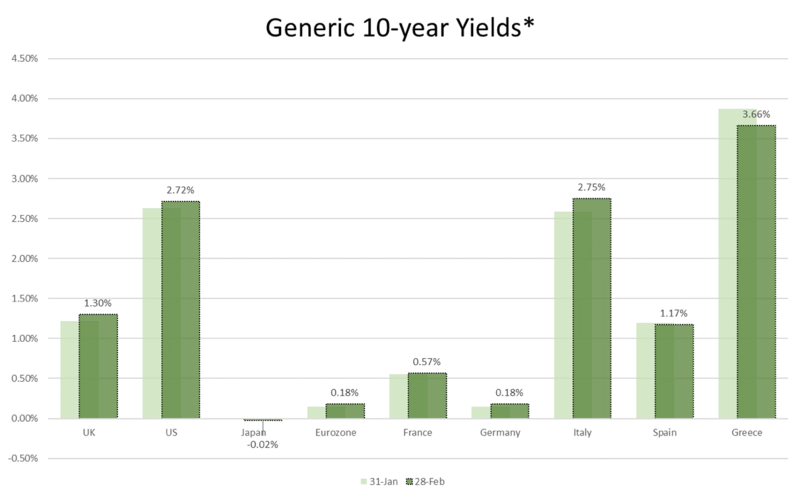 In keeping with the prevailing ‘risk-on’ mentality with which investors appeared to start the new year, the major bond markets saw falls during February, with yields rising across all parts of the curve. A slight increase at the short end of the US curve meant that the curve now appears flat out to 5+ years: A negative signal that is somewhat at odds with economic data being published, which is less gloomy. The Eurozone curve, conversely, remains very steep despite poor economic data, suggesting that the end of QE in Europe may be a factor. Pan-Asian and emerging market bonds showed no net change overall. *A Generic bond is a theoretical bond that always has the specified tenor, unlike a Benchmark bond, which is a physical bond, with a decreasing tenor. The pound jumped to a fresh 10-month high during February against a basket of trade weighted currencies, after it became increasingly likely that Britain will avoid exiting the EU without a formal deal. Against the US Dollar, it went through $1.33 for the first time since last July, when Theresa May outlined her Chequers plan, prompting Brexit secretary David Davis and foreign secretary Boris Johnson to resign. 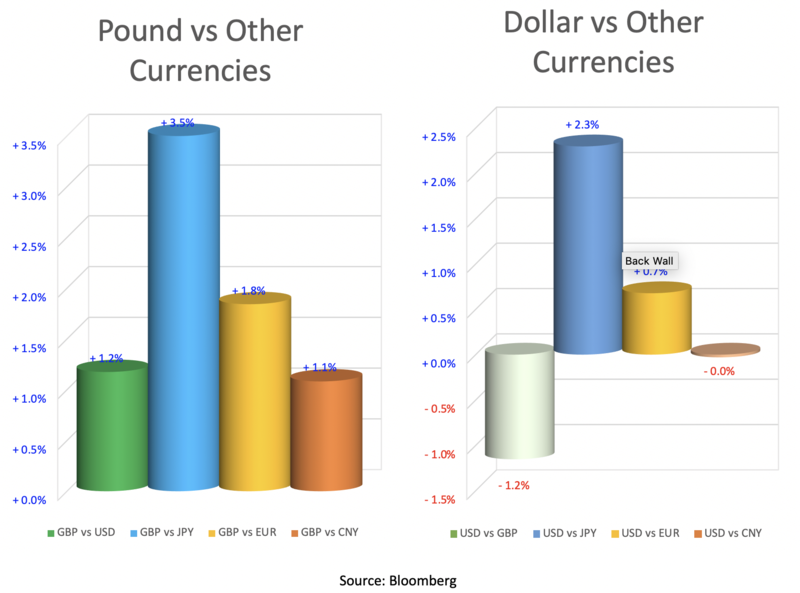 A number of Brexit related developments during the month have led currency markets to conclude that whatever the final outcome, a ‘no-deal’ exit is increasingly seen as unlikely. Theresa May’s agreement to a vote to potentially delay Brexit, alongside Labour’s apparent support for a second referendum (under certain specific circumstances) and an internal push by several Cabinet members to severely limit the Prime Minister’s room for manoeuvre over the threat of a no deal exit, have all combined to lift Sterling against both the US Dollar and the Euro. Behind all this, there is another factor at play. Whilst the probability of a General Election has increased, currency markets are less fearful about the probability of a Corbyn Government. A steady stream of unhelpful headlines, further revelations about the scale of the anti-Semitism problems within Labour and the resignation of several Labour MPs have all combined to weaken significantly the Labour Party opinion poll ratings. A YouGov poll in the Times (22-23 Feb) even had Labour in 3rd place, behind a combined Independent Group/LibDem combination. Markets seem to be pricing in some form of agreed managed exit, even if the timing and nature of that are still not clear. A ‘no-deal’ exit would test recent exchange rate lows in the short term at least, but there seems little sign so far that currency markets are pricing in any real possibility that Brexit doesn’t actually happen, and the UK eventually remains in the EU. Predicting Brexit outcomes is fraught with difficulties and one of the reasons why we haven’t been providing a running commentary is the likelihood that anything you write on this subject can quickly become out of date. Having said that, Brexit inspired moves in Sterling are of material importance for UK-based investors given the scale of non-UK investments in any model. The Core element of the portfolios is designed to avoid directional exposure to Bonds and the volatility of that exposure is magnified by any significant moves in Sterling. Post the referendum, Sterling has certainly been more volatile, driven more by political than economic or interest rate developments, which by their nature are harder to predict. Volatility levels in Bond markets for Sterling-based investors have been more like what one would expect to experience in an equity market. The construction of the Core and the funds that are selected are designed to provide insulation from that increased volatility and so help to deliver a smoother investment journey, particularly for those investors focused on wealth preservation. Subscribe to our updates now to stay up to date with news and insights from our team. Absolutely no spam. Your email address is safe. Unsubscribe any time. This article does not constitute advice. Anyone considering any form of financial planning should seek independent financial advice. First Wealth (London) Limited is an appointed representative of Best Practice which is authorised and regulated by the Financial Conduct Authority (FCA). You should note that the FCA does not regulate tax advice. Past performance is not indicative of future results. The value of your investment may go down as well as up.